Enniatin A is a least abundant commponent of the Enniatin-complex. It has been recently made available as a pure compound, thanks to the most advanced preparative HPLC methods. Soluble in ethanol, methanol, DMSO, DMF. 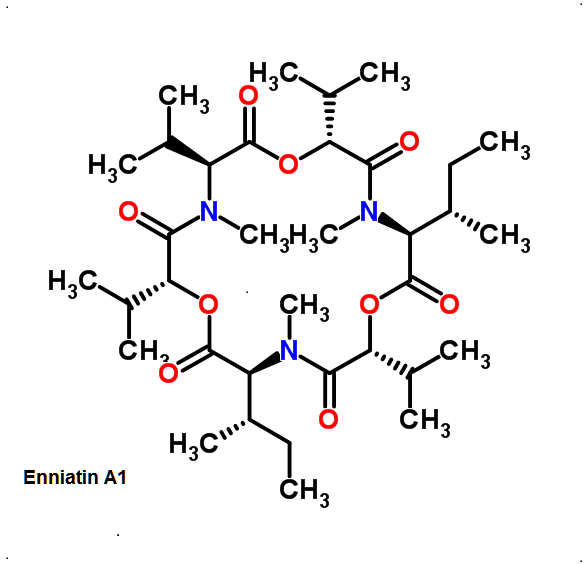 Enniatins are a group of closely related depsipeptides ( oligomers of alternating aminoacids and non-amino carboxilic acids, most often tending to cyclisation). Enniatins occure in nature in the mycelia of some Fusarium species. Being cyclic and hydrophopic molecules, enniatins are able to act as ionophores. More recently their effects on acyl-CoA cholesterol transferase, transporters and the selectivity of their antitumor action have received more focus. 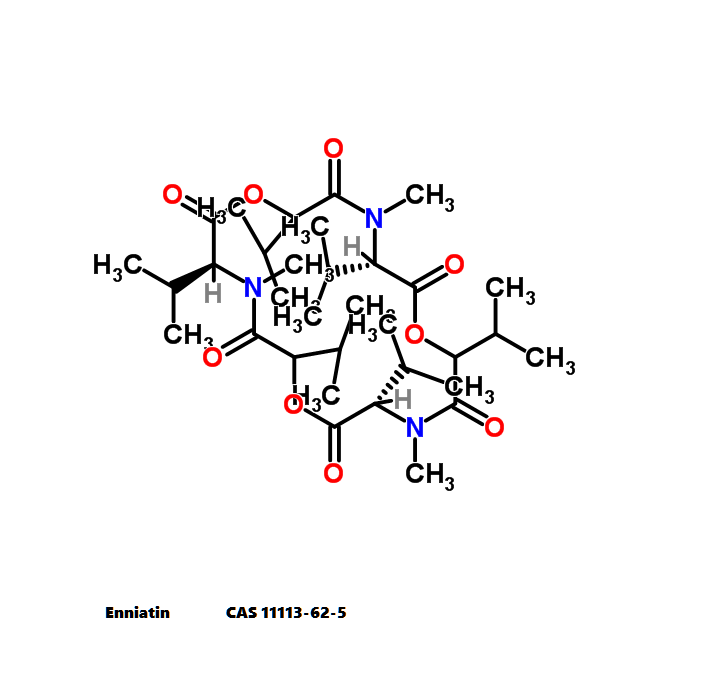 Enniatin A is one of four major analogues of the enniatin complex and has not previously been available for investigation. selectivity of their antitumor action havereceived more focus. Enniatin A is one of four major analogues of the enniatin complex and has not previously been available for investigation. Natural enniatins occure as a mixture of several related analogs, known as "Enniatins", or "Enniatin complex". More recently their effects on acyl-CoA cholesterol transferase, transporters and the selectivity of their antitumor action have received more focus. Enniatin A is one of four major analogues of the enniatin complex and has not previously been available for investigation.